Everyone knows how much of a hassle cleaning can be. Regardless of if you’re scrubbing, spraying, using chemicals or heat, it always takes up a lot of your time and energy. Put your time and energy to better use and let ultrasonic energy do all of the hard work in a much faster, more efficient way! Ultrasonic energy utilizes controlled and high-magnitude pressure changes in liquids to provide you with the highest and most consistent level of cleanliness. It’s also able to get under those annoying unreachable places that standard washing techniques aren’t able to penetrate! Follow the chart to attain a consistent and efficient level for cleaning your plastic tools using the Branson MH series. It’s extremely critical to rid your tool models of all polypropylene dust and oil before you begin advancing to the next steps of your modeling process. You no longer have to worry about inconsistent and unreliable cleaning techniques when you have the MH series doing the cleaning. The same level of high quality cleanliness is achieved every time and all you have to do is place your plastic tools in the bath and follow the recommended formula for cleaning. When you’ve finished your cycle, rinse the plastic tools with clean water and dry it off with hot air. 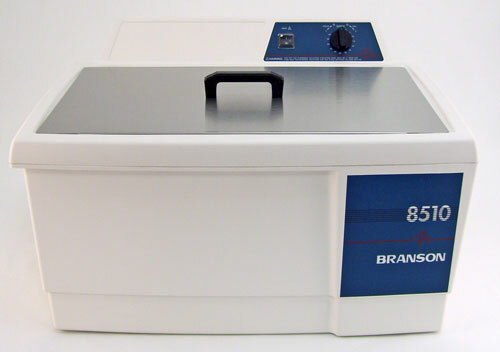 There’s no more headaches when it comes to cleaning – you can sit back and relax while the Bransonic MH series ultrasonic cleaners do the job!